Do you have creative longings that you’ve been putting off until the time is right? Our souls are naturally creative, yet in the midst of daily life, it’s easy to lose touch with this core impulse of life and spirit. We get pulled into the trance of things to be done, and forget to nurture the sense of creative possibility that opens our day-to-day lives into wonder, passion, delight, and enthusiasm. When this connection is lost, the richness of life can feel as though it’s floating “out there,” just beyond your experience. Your intuition may be guiding you to let go of resistance and explore those creative longings. Your spirit knows that a deep sense of well-being blossoms in the sanctuary of spontaneous, creative play and that it allows curiosity, discovery and revelation to be an ongoing part of our lives. Without it, we’re prone to stress, depression, dis-ease, anxiety and many other difficulties that come from repressing our naturally expansive and expressive impulses. You may feel a longing to rekindle a connection to an art form you left behind in the face of other commitments. Or perhaps you’ve never had the chance to explore your creative side and your soul’s natural need for expression is getting ever more urgent. Maybe you’ve always wanted to paint, sculpt, or collage eclectic materials. You have a story to tell or a book to write that has been waiting patiently at the bottom of your “to-do” pile. You haven’t danced in years. You’ve always wanted to sing. Or maybe you want to explore your creativity but don’t know where to start. No matter where you are in your creative journey, a personalized retreat will support your opening to a deeper sense of creative possibility, more wonder, passion and enthusiasm in your daily life. You’ll discover the joyful simplicity of practicing being in flow with who and what you truly are and feeling the center that helps you balance in whatever you do, wherever you are. Start exploring the art forms you’ve always been drawn to, or focus on one. Either way, you’ll get the nurturing support of a soulful artist, writer, dancer or musician to guide you in jump starting your creative process and igniting your passion for discovery and expression. What better place to do it than Ubud, the sumptuous cultural and artistic center of the island? 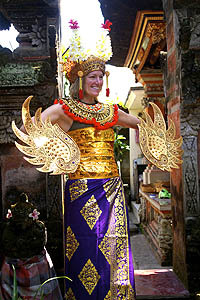 Besides our Western artists, practitioners, and teachers, you’ll be exposed to haunting Balinese music, a living tradition of dancers with nightly performances, exquisite Balinese painters with galleries and studios galore and whole villages specializing in the textiles, rock carving, jewelry making and exquisite craft work that Bali is famous for. 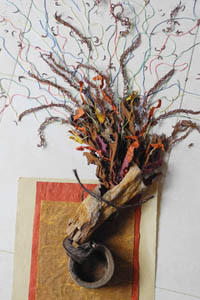 Here, the atmosphere is infused with inspiration that will support your artistic flowering. Don’t put off the creative longings of your soul any longer. Follow your heart’s call to Bali.